After a full day of surfing, you can relax at our purpose built Surf Camp. We provide accommodation that is clean and comfortable and just a short walk to the beach. 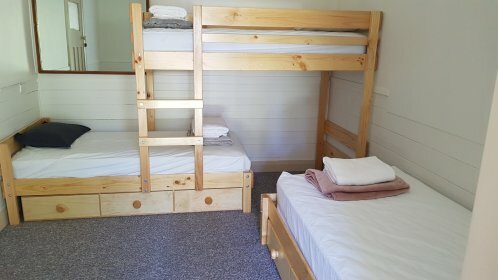 Each cabin is dorm share ( max 7 beds ) with a cool balcony for chill time. 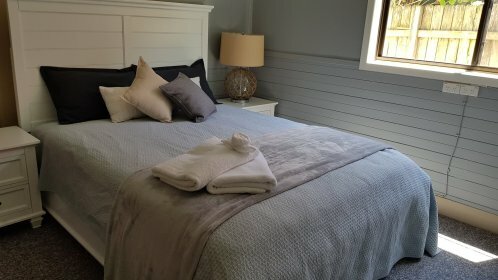 All bedding & fresh linen is provided so you don’t need to bring sheets, pillow cases or sleeping bags. There is also a permanently shaded, outdoor to dining to and to entertainment area located in the centre of the cabins. This area is equipped with a large screen TV and stereo where there is always music or a surfing movie playing. Only 130km or 2 hours from Sydney, Seven Mile Beach is Australia’s best “learn to surf” beach. It consistently delivers ideal surf conditions for beginner surfers.This location combined with our expert instruction and high quality surfing equipment provide the ultimate surf experience. Home of World No.2 Female surfer, Sally Fitzgibbons. She developed her surfing in Gerroa! The National Park is home to an array of wildlife including: honeyeaters, rosellas, kookaburras, kangaroos, echidnas, dolphins. We provide Airport Transfers from and to Sydney and they can be booked in the booking steps. Your own personal surf instructor will set some goals, determine your current level and structure the lesson around your ability. If you’re an absolute beginner we’ll get you up on the waves before you’ve had time to worry about falling off. If you’ve been surfing before, we’ll help you move onto the next steps a lot faster by focusing on technique, board control and bringing out your natural ability.